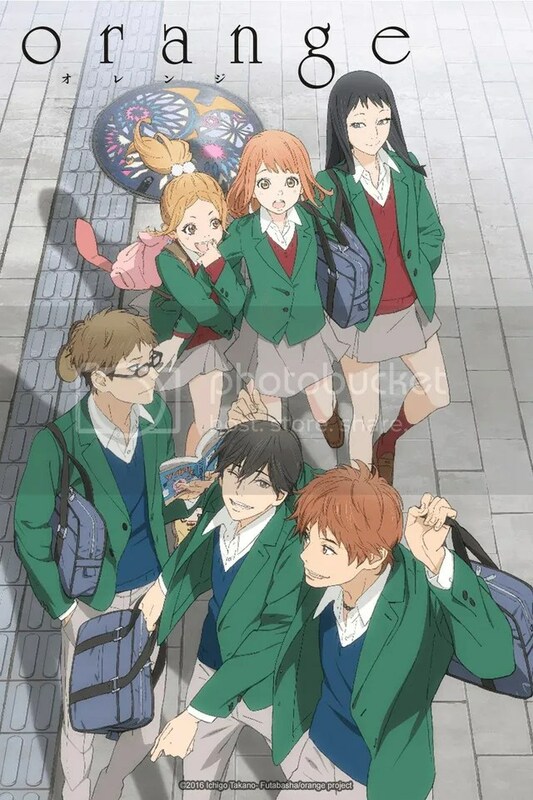 Probably anyone who considers watching anime a hobby has heard of Mari Okada or at least of her more famous written shows like AnoHana or Toradora!. These and some others tend to bring division between the viewers as Okada’s style or just some similarities among the shows she’s worked with aren’t something that everyone could have the same opinion about. Personally I can’t say much as I haven’t seen that many of Okada’s works but I find the melodrama element (especially when it’s teen problems we are dealing with) to be a bit too exaggerated for my taste. Anyway, Okada justly is one of the most prominent anime writers and anything she’s attached to is fated (pun intended since she also wrote the script for Deen’s Fate/stay night) to receive some attention. Especially when some key staff members of the production of AnoHana (and some of them also having worked with Toradora!) are involved, the project they all decided to work on is bound to be waited for and thought to be at least decent. The film Kokoro ga Sakebitagatterunda (which I’d rather call by its English name The Anthem of the Heart because the Japanese title was already difficult to write only once) manages just that – it’s certainly above mediocrity but if it achieves more than being decent is probably up to the enjoyment of the style Mari Okada is famous for. 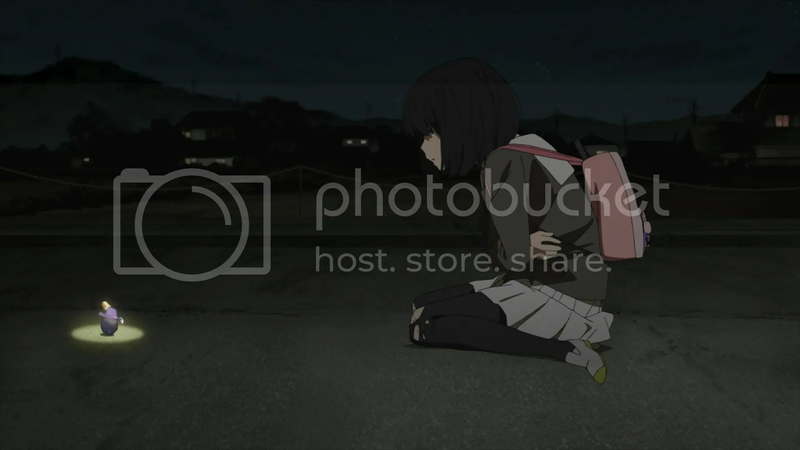 The film wastes no time and introduces Jun, a girl living a colorful and happy life. Everything looked very shiny and cheerful until, well, it didn’t. Frankly it was my problem for not reading the synopsis of the film properly beforehand so the events of the first few minutes looked quite shocking and unexpected, so in other words it was done well. All in all, Jun got burned so much because of her loose tongue that an imaginary egg (a bit random, isn’t it?) helped her to close her mouth (literally) almost permanently. 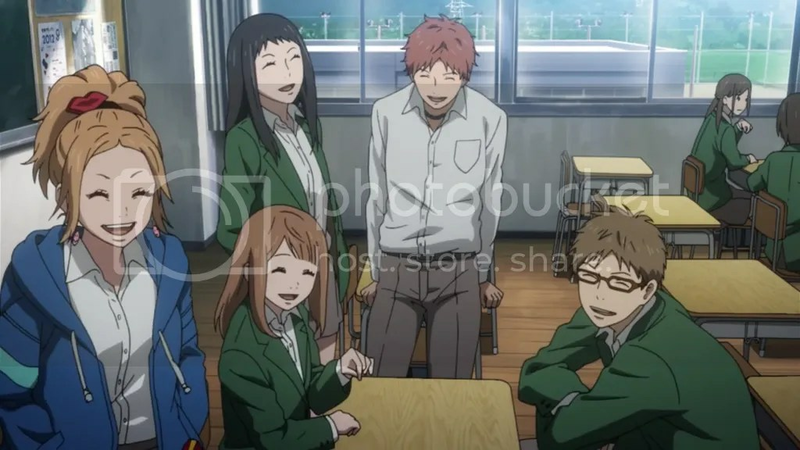 Some years later, Jun, now known as a girl who can’t mutter a single word, and three other kids – a good girl Natsuki, pretty bland Takumi and a baseball ace Daiki – are forced to start organizing an event for the local community. The event ends up being a musical so every little detail has to be prepared for and worked out from scratch. Cooperation is a must and all the four are forced to organize everything together and become more open between themselves, some more willingly than others. 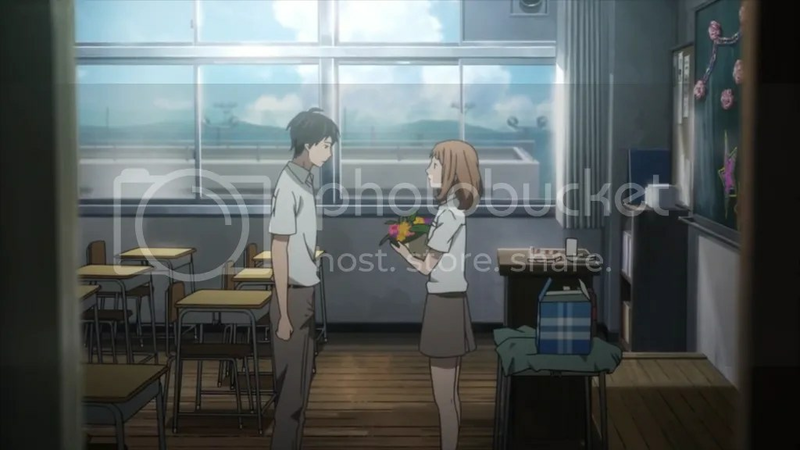 Of course there evolves an element of romance in the film – the writer was Mari Okada after all. Now, as random (and spoiler-y) as it is, let’s talk about eggs. In itself, an egg is a perfect symbol and in this case it represents all the things that Jun locked inside herself so she wouldn’t make any more mistakes by talking too much. The continuous cracking of the egg accompanies Jun’s efforts to speak and slowly grow her relationships. 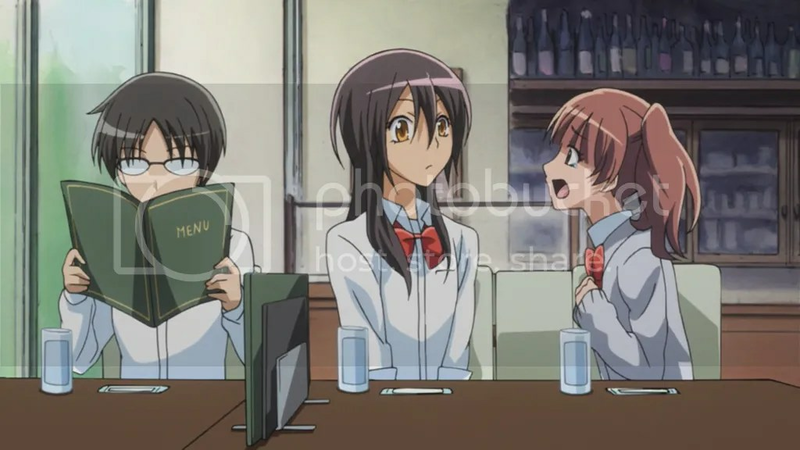 Eggs also appear as something Takumi encounters on the day of forming of the group of four and work as a catalyst of Jun’s infatuation with him. 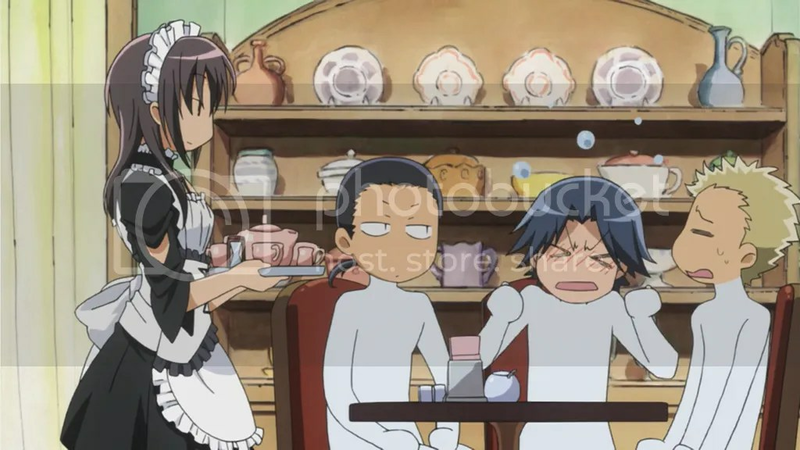 Also, in retrospect the scene near the start when Jun’s mother tries to silence her by feeding her a bit of an egg gains some symbolic significance – it was mainly the mother’s influence that lead towards Jun’s closing off – it’s as if the mother herself started growing an egg-shell around her daughter’s expression of emotions. 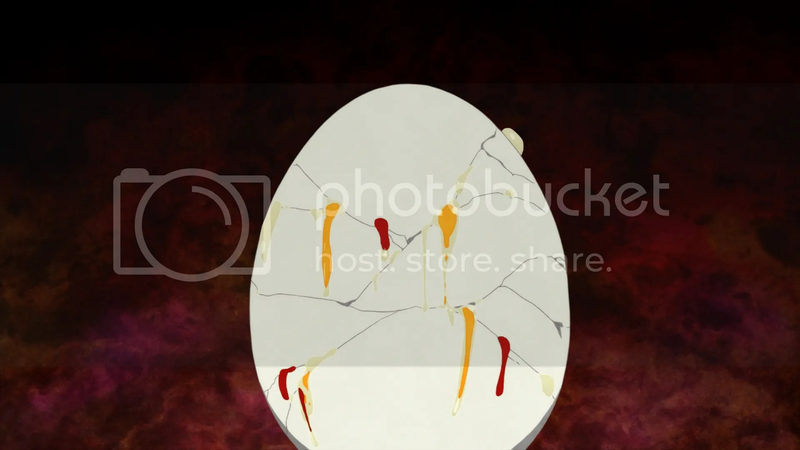 Everything’s so far all good and well but let’s think about how actually the symbol of an egg connects with the story. Why it was namely an egg Jun imagined that closed her lips? Why this story should feature eggs at all? To me it feels like the story was written and then someone just randomly thought about adding some symbolism. Symbolism and metaphors are an excellent thing in storytelling but I believe they should flow from the story, be an integral part of it. In this case the story barely changes if we omit the egg element. Moving on, the ending wasn’t to my liking. The climax was as emotional as it should be but after that things got a bit out of hand. I still think that the main point of the film was to show Jun’s transformation and other aspects should just accompany it. Yet, the ending featured implied romantic futures for all the characters and I doubt the film would have lost much without it. Especially one pair felt very forced as the characters got only one scene in which they were alone and the scene itself hardly hinted any future developments between the two. Yes, some character growth can happen outside the scenes we see but the goal of pretty much any film is to show some developments happening and the viewer, seeing gradual journey of the characters, can be rewarded by the payback when the journey, whose vague direction was visible beforehand, finally reaches its end. Seeing something like two people having a conversation and then starting dating after a while isn’t going to bring any joy of accomplishment. At first glance the main characters couldn’t be more clichéd. Apart from the fact that Jun has a (quite) objective reason to be mute, she basically falls into the category of cute little clumsy moe girls who because of their shyness are able to converse only by sending text messages. By the way, Jun grew attached to her new friends so soon that I began to wonder why she hadn’t started making friends earlier. With her enthusiasm even conversations via text messages seem a pretty possible way to communicate. Natsuki of whom we learn a bit less behaves mostly like a typical tsundere and her other traits like being able to lead people are not that explored. Takumi is just your average protagonist who tends to be dull and reminds me only of Oreki from Hyouka but probably only because of his hair. Only his ability to play the piano gives him a trait that makes him different from any secondary character. Daiki is a usual huge sports guy with a tendency to be blunt and sometimes aggressive. The biggest development throughout the film is seen in Jun as her struggle to convey her feelings (and thus becoming more socially open) through song and word become easier and easier albeit feelings are not that a simple topic. Daiki undergoes a transformation from a hard-headed dude to someone that recognizes others as also having some talents. Also, it was quite unexpected for me to find out that Daiki (as well as all others) was a pretty decent singer – quite unusual for a sports guy unless the things in Japan are really different from over here since when I was at school, I couldn’t expect at least half of my class to be able to or to be bothered to sing not half bad. 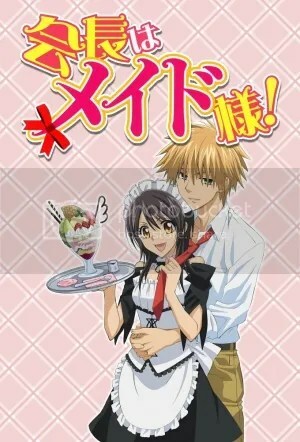 Takumi and Natsuki achieved far less since the film’s main focus is set on the character arc of Jun. As it’s usual with films, the visuals are way more polished than in your average TV series. 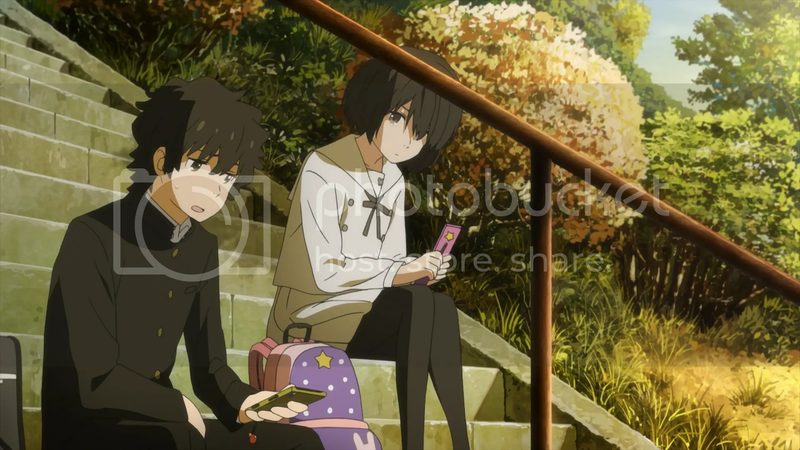 Also, it’s A-1 Pictures who despite some people not being content with their working style and the stories they choose to portray keeps a pretty consistent reputation of being good at production. The Anthem of the Heart is no exception. Sometimes during the watch I just had to stop and take some time to appreciate the backgrounds – vibrant colors and many details make every scene outdoors look very alive. Character designs don’t stray much from usual anime material. 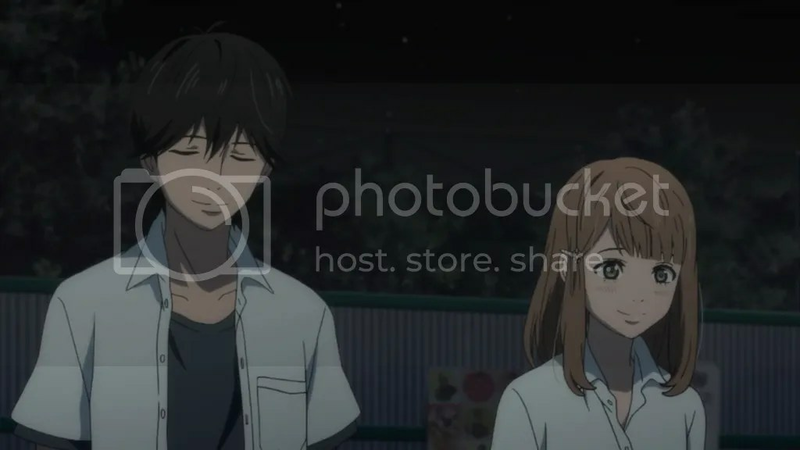 I only have one nitpick – lower parts of the eyes of the characters have particularly bright light reflection zones so almost any time they seem to be on the verge of bursting into tears no matter what. I guess for a film with drama elements it might be appropriate but at least for the neutral scenes the brightness could have been reduced a little bit as it becomes distracting. The Anthem of the Heart revolves around making a musical so it’s nothing exceptional to have a soundtrack that is a bit different than usual. 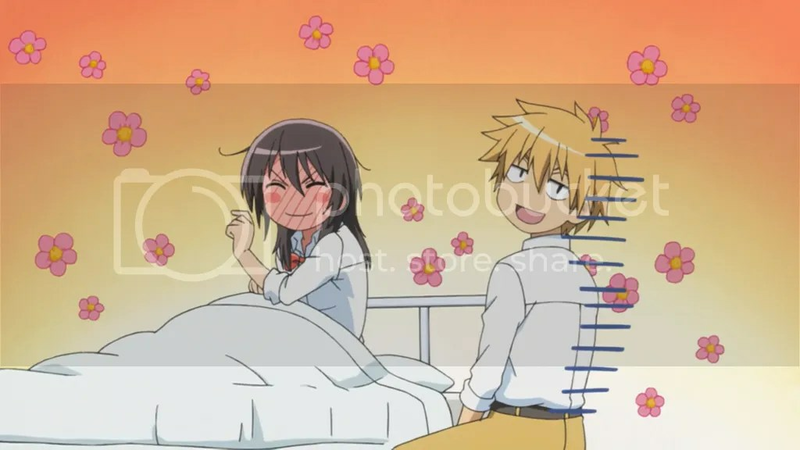 The parts of the film that doesn’t feature the actual musical performance (or preparation for it) are accompanied by simple and relaxing music, no different from other shows that have some slice of life moments. While watching, everything seems alright as the music works well with the developing story, however, the released tracks are a bit underwhelming – not many of them are long enough or feature something worthy to be constantly listenable. Yes, it’s warm and pleasant but beside its background purpose the majority of the soundtrack is not very distinguishable or far from being serviceable. On the other hand the musical part is far more interesting. 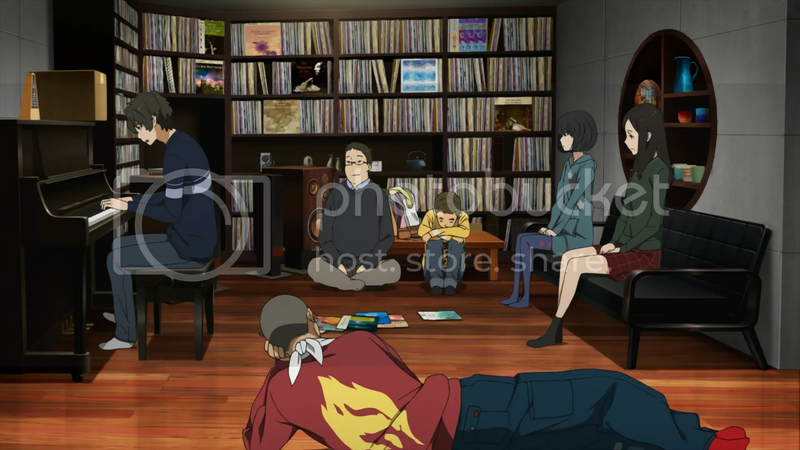 The characters decided to choose already composed music and only add their own lyrics. The arrangements ended up being pretty enjoyable. How else if the featured music involves Gershwin’s Summertime or Beethoven’s Sonata Pathetique among others. All in all, did I have a good time watching The Anthem of the Heart? Yep, mostly. From the start it’s clear that the main focus of the story will be Jun’s recovery from her muteness and that she will probably overcome it but it’s still worth to experience the journey. Of course there are some drawbacks such as not having enough time to spare for each of the main four characters, a bit forced resolution of all the characters’ relationships or just the egg element, which in itself being very interesting and thought provoking, didn’t blend that organically into the story. Nonetheless, other things like quite well incorporated music elements, Jun’s moe-ness and the emotional payback makes up for that. 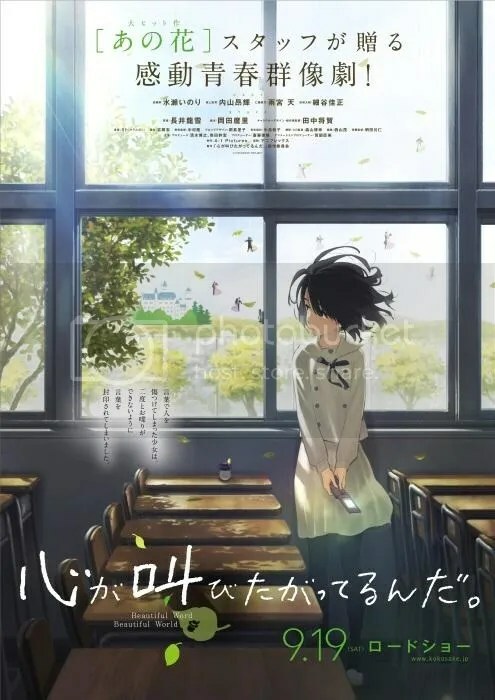 The Anthem of the Heart isn’t a very exceptional film, though some of its elements are impressive and I believe most of people shouldn’t be very disappointed if they choose to invest their time into watching this anime. Tugging of your heartstrings is not guaranteed though likely enough.